We decided to refresh and re-JUICE-enate a blog post that Chris wrote in 2005. Click here to read the original. The way the game of analytics is played today, there isn’t much competition. The statisticians are on the field, the storytellers are on the bench—or in the stands—or, sometimes, not even in the stadium. We first expressed this sentiment almost a decade ago, but in the last ten years not much has changed. 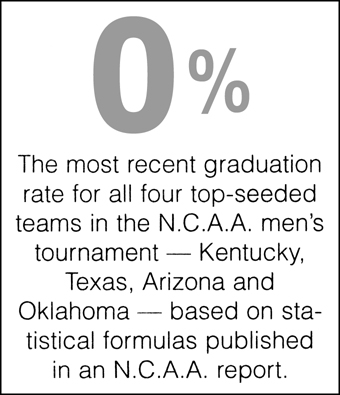 There may be a lot more players, and there is definitely a lot more data, but statisticians and storytellers still aren’t playing on the same field together. In Chris’ earlier post we proposed that the answer to getting statisticians and storytellers to work together lay in the visualizations themselves. We still maintain that’s true, but believe that there is a bigger emphasis needed on storytelling and fostering discussions among people about data. While visualizations were relatively new ten years ago, today every CFO around the world has already approved their first visualization purchase order. Unfortunately, there’s too much focus on charting capability vs. bringing these teams to together to solve real business problems. As Chris stated 10 years ago, visualizations should be designed not to just reflect data, but to engage the user with a story. When visualizations are approached in this way, it provides the perfect environment for statisticians and storytellers to collaborate and succeed. At Juice, we’re now ten years into our story, we continue to help organizations bridge the gap between statisticians and storytellers. To learn some of the recent stories check out the case studies on our travel and hospitality, digital advertising, research, and healthcare solution pages. Give them a read and share your story in the comments below. Hey all – we have developed a great relationship with John Stasko, Associate Chair of the School of Interactive Computing program at Georgia Tech and the General Chair of the upcoming IEEE VIS 2013 conference. As we’ve talked with John, our conversations seem to always come around to the need for a tighter connection between academia and industry. As a result, we thought it’d be great to introduce John to our tribe through a guest post. Below are just some of the ways John is working to bring academia and industry together. Enjoy! 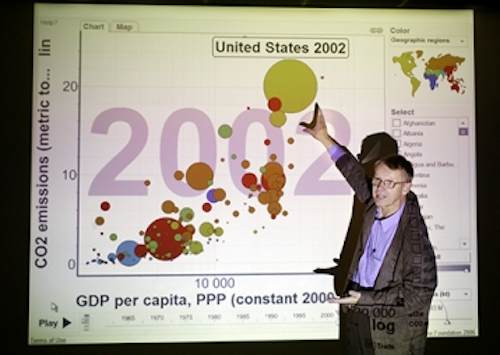 Hello - I’m a professor at Georgia Tech and I’ve been working in the data visualization research area for over 20 years. My friends at Juice asked me to write a short guest blog entry providing perspectives from the academic data visualization community and exploring ways to foster more industry-academia collaboration. I’ve found that we don’t work together often enough, which is too bad because each side has a lot to offer to the other. I personally have benefited from business collaborations in many ways. Since data visualization research is so problem-driven, industrial interaction provides an excellent way to learn about current problems and data challenges. In my graduate course on information visualization student teams design and implement semester-long data visualization projects. I encourage the teams to seek out real clients with data who want to understand it better. Some of the best projects over the years have resulted from topics suggested by colleagues working in industry. Additionally, I often employ guest lecturers such as the guys at Juice to come and speak with my students and provide their own insights about creating visualization solutions for clients. I hope that in some ways my class is benefiting industry as well and helping to train the next generation of data visualization practitioners. Students learn about all the different visualization techniques and their particular strengths and limitations. They also get hands-on practice both designing visualizations for a variety of data sets and using current “best practice” tools and systems. The course has become a key piece of the Master’s degree in Human-Computer Interaction here at GT. Another opportunity for interaction is academic research forums such as conferences and workshops. Coming up this October in Atlanta is IEEE VIS, the premier academic meeting for data visualization research. VIS consists of three conferences: Information Visualization (InfoVis), Visual Analytics Science & Technology (VAST), and Scientific Visualization (SciVis). Last fall, the meeting garnered over 1000 attendees for the first time. VIS is an excellent forum to learn about the state of the art in data visualization research, see the latest systems from commercial vendors, and just rub elbows with like-minded friends and colleagues. Recent papers at VIS presented tools such as Many Eyes and D3, introduced techniques such as Wordles and edge bundling, or just pondered topics such as storytelling and evaluation. And the meeting has much more than just research papers – It also includes numerous workshops, tutorials, panels, and posters. This year for the first time we have added an “Industrial and Government Experiences Track”. This program is designed to highlight real world experiences designing, building, deploying and evaluating data visualizations. The presentation mode for this track will be posters on display throughout the meeting with multiple focused interaction sessions. Each submission should include a 2-page abstract about the project and a draft of the poster. They are due on June 27th. More details about the track can be found on the meeting home page. I hope to see many of you at VIS in October here in Atlanta! Most of our work ends up as business-to-business data solutions (like US News' Academic Insights), but occasionally we create visualization solutions for broader public consumption. One example is the new website for The Essential Economy Council, a non-profit and research organization based in Atlanta, GA. They've collected nine years Georgia Deptartment of Labor data and we're helping them turn it into a compelling and easy to understand story. Go ahead and check out the interactive map of Georgia to learn about an important and under-represented portion of our economy. We're teaming up with O'Reilly Media to challenge you to participate in a data visualization contest leading up to O'Reilly's Strata New York Summit September 19 - 23. Data has become nearly as essential as food in both our personal and professional lives. So, why not use food as the basis for a data visualization contest? Join in the competition and visualize information about all the delicious fare our society enjoys. (First, you'll want to put down that chicken wing, lest you get sauce on your keypad.) Being the foodie you are, you'll appreciate that we've found some pretty cool data sets from FoodFacts.com for you to play with, making this subject matter you can really, uh, sink your teeth into. A Trip to NYC, Strata Conference Passes and More. The grand prize winner will win a trip to the Big Apple to present their winning visualization at the O'Reilly Strata NY Summit in New York, NY September 20 - 21, 2011. Other prizes include Strata NY Conference passes, ebooks from oreilly.com and more. Sweet. Who would pass up an opportunity to get the attention of these judges, let alone have their work reviewed by Flowing Data's Nathan Yau, The New York Time's Amanda Cox and Juice's own Chris Gemignani? Serious bragging rights. More information about the challenge categories, the rules, the prizes, the judges, judging criteria and all you could possibly want or need know about the contest is here. 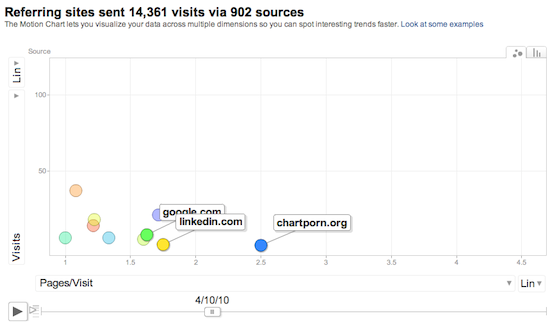 So, get started on your data visualization now, while your appetite is whet for competition. Entries are due by August 28, 2011. Juice Fans Get 30% Off Strata NY. Register now to attend the O'Reilly Strata NY Conference, and get 30% off your registration fee with the special Juice fan discount. Just enter "JUICE" on the conference registration page. Learn more. I grew up in a bilingual household where we spoke French and English. Many of us who've been exposed to other languages realize that there are some words that just don't translate well into English. One of the words that got used often in our family was the French word gourmand. Its closest translation in English is gluttony, but how often does anybody ever say that word? Probably the simplest way to think of it is the antithesis of gourmet, or even better, someone who prefers quantity over quality. While there can sometimes be a negative connotation with the phrase, "Il est gourmand," ("He is gourmand"), it can also be just a recognition of someone's preferences. To this day, even though my French has gotten pretty bad, I still occasionally refer to people as gourmet or gourmand. It could be when I'm sitting in a restaurant, standing behind them in line at Costco or even hearing about their current data initiative. What is a data gourmet? Just like a food gourmet, a data gourmet is someone interested in something distinctive, visually appealing and inspired by results or action taken. It isn't about hordes of numbers or metrics. It's about getting the right metrics in place, putting them in the right context and letting them stand out. 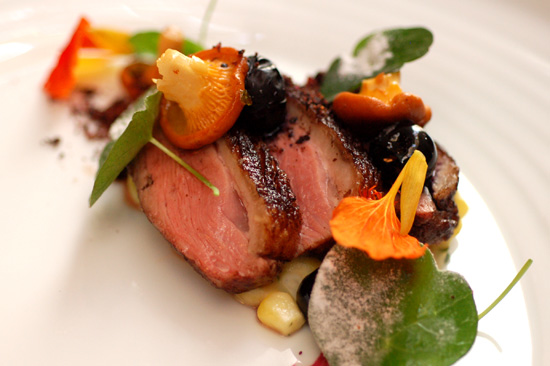 Think of the chef who prepares the meal like the one in the picture. He or she not only wants to stimulate your taste buds, but also hopes that their use of color, plating and white space will appeal to you and your visual senses, as well. What is your data gourmand? So, as I alluded to earlier, not everyone is a gourmet. Many people value quantity over quality. As it relates to data, someone who is a gourmand is probably unsure of what they really want to do with all the data they are requesting. They figure it best to get as much as they can while they can, especially if they aren't sure what they will do with it. Unfortunately, they probably have never been exposed to a really useful dashboard or visualization. Ultimately, what they think will satiate them and potentially their users is as much data as possible. However, the volume of data would net a number of metrics, charts and gauges, etc. that would be more than they could ever consume. When you find yourself in a situation where you are working with a data gourmand (and you will - it's just a matter of time), don't look down your well-trained visualization palate at them. Instead, gently guide them along a path of visual-epicurean transformation. Most likely, they're going to want to load up their dashboard plate with every bit of data junk they can find. Start by getting them to see their dashboard as a blank palette to meet specific goals vs. an empty pallet to load up everything they don't need. As they select different metrics, invest the extra time to train them to carefully select just the right information that provides the balance their data diet needs for a healthy body. As they make their selections, help them to see that it's okay to have favorite metrics. As Amanda Cox of the New York Times says, "Data isn't like your kids. You don't have to pretend to love them equally." Finally, if you need some help, refresh your skills with the Juice white paper, "A Guide to Creating Dashboards People Love to Use". Once you've finished, ask yourself these questions. Does everything in front of your gourmand now have a reason to be there? Did they pause in appreciation or comment that they can't wait to use it? If so, you may be well on your way to executive data-chef status. Have a data gourmand/gourmet story of your own? We'd love to hear about it in the comments below. Juice's Jon Buffington took center stage at the National Capital Area Google Technology user's group in the D.C. area recently and busted some fancy moves. And, you should have seen him once his presentation started. Taking the group through the process of designing and implementing an interactive data visualization using Google Web Toolkit (GWT), Jon also incorporated DOM, Canvas, SVG, ReST and Scala browser and server technologies to complete the information experience. GWT is an open source development toolkit for building and optimizing complex browser-based applications, and is used by many products at Google, including Google Adwords and Orkut. Download the presentation, and adopt some formidable moves of your own. Jon leads our product development team here at Juice, and crafts ingenious software technology that transforms data into information experiences. You can check out more of his work, specifically, here. A lot of the applications that Juice creates are designed to make information more accessible to people who wouldn’t consider themselves to be data experts. They realize the value in the data that they have, and in many cases they have some sort of analytics solution in place, but they know they’re not getting as much value from their data as they should. One of the hurdles we frequently come up against is that people who aren’t actively participating in the visualization discussion don’t know what’s possible. All they’ve ever seen, in many cases, are the confusing dashboards, charts, and graphs that are all too prevalent from the vendors in our space. You know the ones: a thick layer of technology slathered with some gloss and wiggle, between two slices of "do it yourself". In many cases, we find ourselves closing this gap by referring to some of the best examples of work out there. As we were thinking about this, the idea to provide a simple walk through of these examples came into being. The result: a 30 day calendar chocked full of some of the best samples of skills enhancing examples we could find. Each day is a bite sized chunk and takes only a few minutes to watch, read, do, or play. Some of the days are comprised of Juice content, but most days are from other sources that we’ve found useful. You can download it to use yourself, or to share with your friends who need to expand their info-viz horizons. Either way, we think it’ll get your creative juices flowing. One thing we really like doing here at Juice is meeting and talking with folks who are interested in the practical application of visualization techniques to make their jobs and businesses better. We know a lot of you out there feel the same. So, we’re planning meet-ups in three cities over the next few months -- Atlanta, Washington, D.C. and Boston. In addition to giving those of you in these areas a chance to get together in one place at the same time, it will give us a great excuse to share some data visualization knowledge that we think will benefit you and enhance your skills. Each Juice Tour event will start with a meet-and-greet followed by a presentation focused on some basic rules for effectively communicating data - where we will provide you with some easy-to-use principles that you will walk away with, leaving you to become far more proficient at presenting your data forward no matter who your audience. Afterwards, you will have an opportunity to meet one-on-one with Juice in free mini-problem-solving sessions where we can talk specifically about your visualization problems and offer suggestions to help you work through them. Memorable or Actionable or Both. Recently, I saw the largest concentration of iPad users in the world, controlled a computer screen with my eyes, and learned about our looming robotic future. No, Apple doesn’t have a technology lab on the moon, but I did attend CHI 2010 (short for Computer Human Interaction - the entire program along with papers and authors are referenced here). I left with a bit bigger toolkit and plenty of research to consider further. One such effort investigating chart junk has been reviewed by EagerEyes’ Robert Kosara. I share his enthusiasm for research in visualization, but let’s look more closely at some issues the paper raises and consider how these findings fit into the goals of visualization. 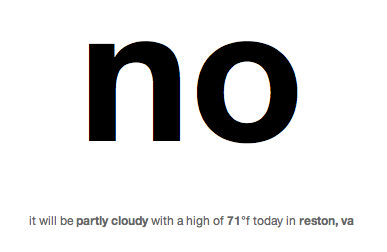 our results question some of the premises of the minimalist approach to chart design. most enjoyable and easiest to remember. More memorable is better, right? The question we should be asking is, better than what. Of course, more memorable is better than less memorable, but at what cost? And what do we really want people to remember? It’s doubtful the best way to drum up interest in data is by making it light up and do a dance to feed the public’s already marketing heavy information diet. Perhaps one’s attention is more likely to be drawn to these embellished charts if they are engaged in an entertaining or passive ritual, like watching TV, browsing the web, or shuffling through a newspaper. Perhaps they get the same personal impact as the funny pages. We should consider a greater sense of bias or value message is introduced through this style of data presentation (as confirmed by the study), and that can be detrimental to a viewer’s trust. It isn’t that imagery doesn’t have a place in the same conversation with data, but there are better ways to go about drawing attention than applying illustrations to data points. In the data presentation arena, we definitely want data to be memorable, but even more so we want data to be actionable; therefore, valuable data remains the attraction. 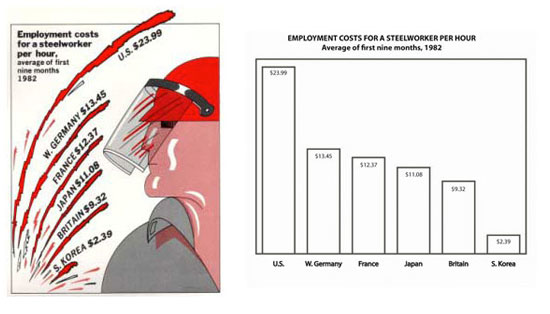 Edward Tufte describes the use of this graphic by the New York Times that accompanied a data dense table along with a news column on the subject. It’s a simple point: in order to present meaningful, compelling, or personally motivating information, there either needs to be exactly the right data presented, given the context of the data and person, or enough dimensions and slices of data to be meaningful to a broader range of questions and needs. Supporting textual content always helps to tell the story, which builds the viewers mental model - thereby, making the data more understandable. Requires more patience or experience from viewer. The problem with embellishments as a primary style for getting the public engaged with data is that it continues to suggest that truly understanding how data impacts their world is beyond common thought or interest. The dimensions are minimal and value statements dominate. Its Communications 101: say what you’re going to say, say it, and say what you said. When the information is somewhat clearly target and not exploratory in nature, this frank approach is often more effective. Embellished charts commonly stand alone with no supporting, meaningful story or conclusion. If the information is valid and valuable enough to be published, there should at least be enough effort to find and integrate a reliable source with more info to answer questions where the chart data left the viewer wondering. When it comes to complicated information, stop treating it as if it can be polished nicely into a single chart and that will be sufficient to create understanding, motivation, and action. Charts make data visible and play off our innate human need to create a mental image of the information story we’re presented with. We need both visual attraction / definition and concrete factual data. Illustration, graphics, and photography trigger emotion and interest in our right brain. They give us a chance to associate ideas and create mental connections to make sense of the world. Our right brain needs "embellishment" thinking to make connections. Meanwhile, our left brain needs values, raw facts, and the ability to measure worth. Our left brain needs "plain chart" thinking to determine the cause and effect of connections; its interested in thinking about what really matters and impacts things at this moment. 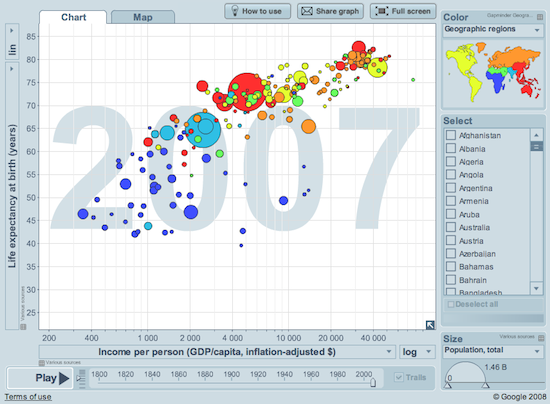 There are few visualizations that even begin to approach the balance between imagery and data. Example 1. The Tweet Tracker visualization is at least on the right track. 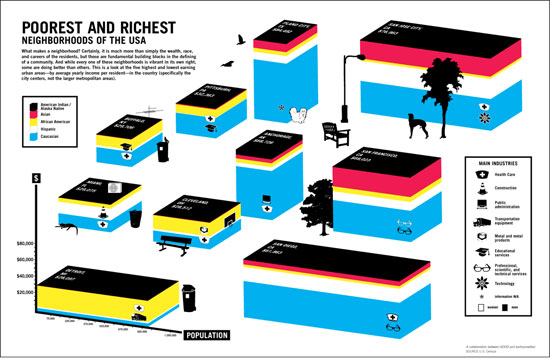 One may say here that illustration is used as data points, but I would suggest the technique is appropriate here because the imagery is uniquely matched, within context, as another dimension to its data category. 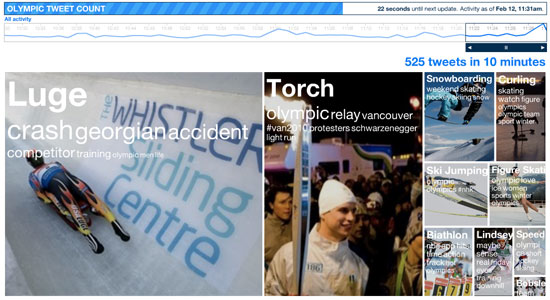 Winter Olympics Tweet Tracker by Stamen. Example 2. Embellishments come in diverse forms. You may have seen this presentation Al Gore gave on global warming. Notice what happens at 9:08 in the video as Al continues his commentary while riding a lift on stage up the side of the chart. Do you hear the background laughter? This kind of laughter is good. You know you’re audience is engaged. Duarte Design designed an embellished visual here to grab people’s attention and make the point memorable - alongside the data chart. This engaging visual device makes the data more memorable because the data is still the center of attention. Visualization is simply the best language to create meaningful connections between data, thereby making it valuable. All charts are related to visualization, whether its good design or not. The conversation of whether embellishments are good or bad depends on many things, but the real question we should be asking is whether they are making your data more or less valuable. It is a fine thing to attract interest to data, but not when that is a device to overlook the real care needed in preparing sufficient information. Plain charts are fine also, but likely only for quick personal projects in excel where a mental model of the data connections are already well understood. I’m thankful for Scott’s work with his colleagues on this research, and for people like Robert who also promote appreciation for the much needed research in visualization. The theme of graphical embellishment is thrown around so much in the visualization community that it rarely receives careful deliberation, and this paper starts a purposeful conversation. However, there is a long way in working towards conclusive goals. Useful Junk? The Effects of Visual Embellsihment on Comprehension and Memorability of Charts.